Fried apple pies like Granny used to make—sweet apple filling inside tender, lightly fried pastry dough! Simple Southern cooking at its best! This fried apple pie recipe is not like the fried pies you buy at the truck stop or get in a restaurant. These are old-fashioned fried apple pies, with a dough that’s crisp around the edges and slightly softer in the middle. The filling comes from dried apples, which is the way lots of Southern grandmothers made their apple pies, like my friend Ray’s grandmother. My dear friend Rita was out of town recently, which meant her husband, Ray, was home alone. There are a few things that I know about Mr. Ray. One—he loves good, Southern country cooking. Two—he married a woman who not only is from New York but also is the healthiest person I know, which means that, Three—they don’t eat a lot of Southern country cooking at their house. Although, let it be said that my friend Rita from New York is a fabulous cook and has adapted well to Southern cooking, she just doesn’t do it very often. But she eats rutabagas. And turnip greens. And she makes the best sausage risotto that I’ve ever had! But, I digress. The other important thing I know about my friend Ray is that he LOVES fried apple pies—specifically, the kind of fried apple pies that his Granny used to make—and my Granny’s fried apple pies come pretty close! Granny would make these pies for no special reason other than to have something sweet in the house. I can see the plate on the end of the kitchen table, covered with a towel, where we could nab one whenever we happened by. They never lasted more than a day or so, and although best when hot from the skillet, they are also delicious at room temperature. Uh, ok. Could you be a little more specific please? I thought maybe lessons were in order, so when Granny came to visit we had Fried Apple Pies Day. Those turned out perfectly because she did most of the work. After she left, I tried them on my own and realized I hadn’t written anything down and my memory completely failed ain’t what it used to be. I had to have another Fried Apple Pies Day with Granny in which I did the work and remembered to write things down. This is the thing about old recipes and old ways, a heritage which could easily slip away. Most dishes that our grandmothers or mothers or great-grandmothers prepared didn’t have written instructions or ingredient lists. Instead, they existed as integral parts of daily life. You got up, made biscuits for breakfast, maybe fried chicken for dinner (now known as lunch), and maybe pot roast for supper. Then you did it again the next day with a different variety of foods. You either cooked seasonally from your own garden, or used vegetables that you had canned or frozen when they were in season. Although I would be the first to admit that a lot of Southern cooking would not be considered healthy and not something anyone should eat everyday, I think it’s important to make sure that your family recipes are preserved. Even the butter-laden, flour-covered, fried foods. You might change things and add less butter or sugar, more fresh vegetables or panko instead of flour, but you should have the originals to build from. Spend a day or two in the kitchen with your mother or grandmother or father as the case may be, and write things down, take pictures and learn the techniques so that your memories can live through you for another generation. You’ll need a good skillet to fry the pies in, plus a rolling pin and if you choose, a pastry cutter, although I never use one of those. 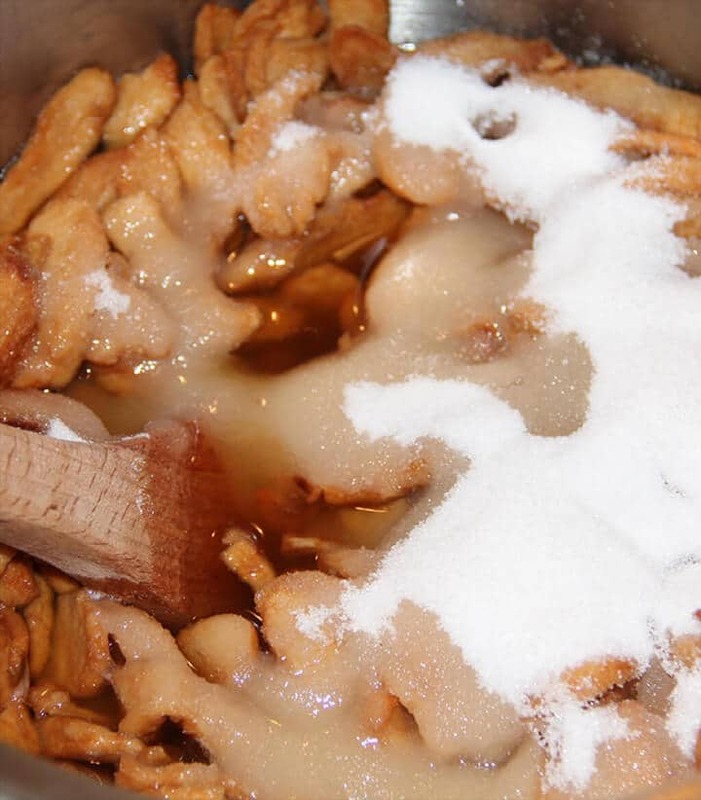 For this fried apple pie recipe, start with 3 or 4 bags of dried apples and put them in a pot with enough water to just cover the apples. **Cook’s Tip: If you can’t find dried apples in your grocery store—and don’t buy the commercial ones in the aisle with all the dried fruit because they take forever to cook down and they are expensive—try these that I found online. The best place to get dried apples is at an apple farm if there’s one close to you. And don’t be shy about purchasing because the bags will keep for a while. Add about 2 cups sugar. Turn heat on high and bring to a boil, then turn it down to a simmer and cook down until the apples are tender and juicy. This will require quite a bit of tasting since that’s the only way to know when they’re perfect. You’ll need to take your spoon and sort of chop at the apples to help break them up a bit. And you’ll probably need to add additional water. Stir frequently so the apples don’t stick to the bottom of the pot where they will scorch and then you’ll have fried apple pies that taste very bad. Scorched apples = bad fried apple pies. 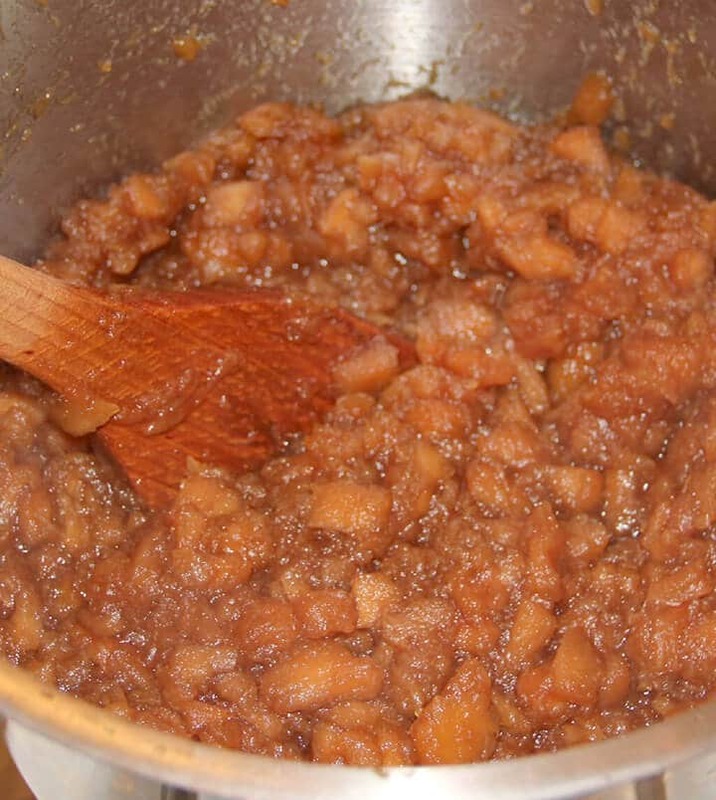 After about 45 minutes to an hour, your apples should be the consistency of a chunky applesauce. Taste them again and make sure they’re sweet enough and smushy enough. Smushy being a highly technical cooking term. This is how the cooked apples should look. Remove the apples from the heat and let them cool while you’re getting the fried pie dough ready. **Cook’s Tip: Place some of the apples in another dish to help them cool faster. For the dough, start with about 4 heaping cups of self-rising flour and add shortening and butter. **Cook’s Tip: I recommend White Lily flour because it’s lower in protein and gives you a more tender crust. Mix the shortening and butter into the flour with a fork or pastry cutter, or just do what I do and dig your fingers in there. Mix well until the flour crumbles and has chunks a little smaller than peas. **Cook’s Tip: You want to make sure all the shortening and butter is incorporated into the flour. Dough should get crumbly like this. 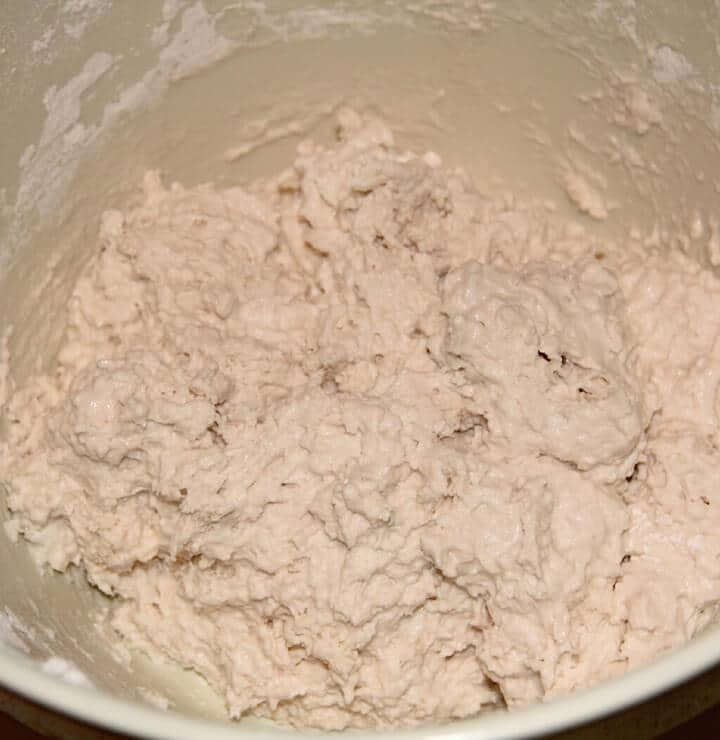 Stir ice water into the dough with a fork, scraping underneath the dough to mix in all the dry flour. Mix until dough is sticky and there would be no way to pick it up. 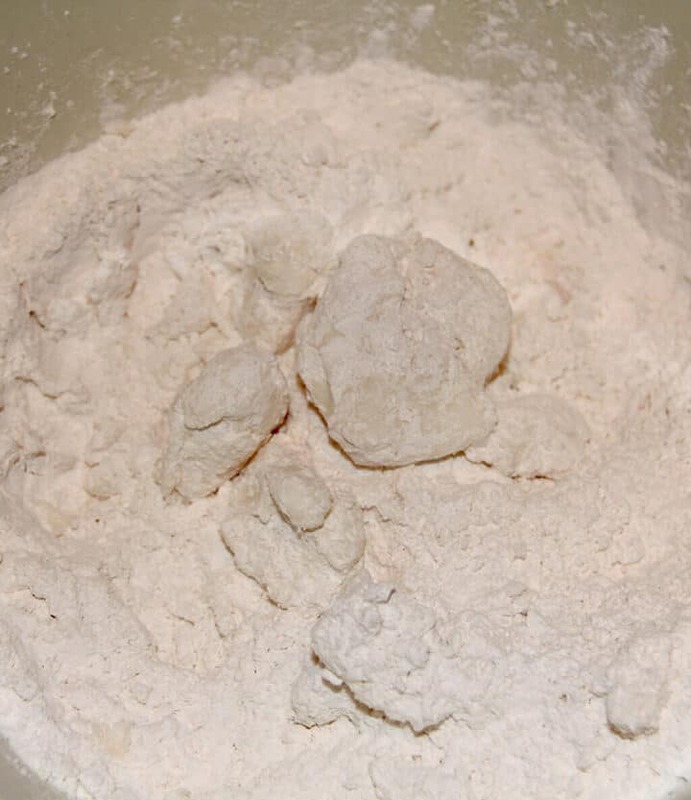 Dip both hands in flour then sprinkle a little flour on top of the fried pie dough, lift it up, and sprinkle a little more flour along the sides. 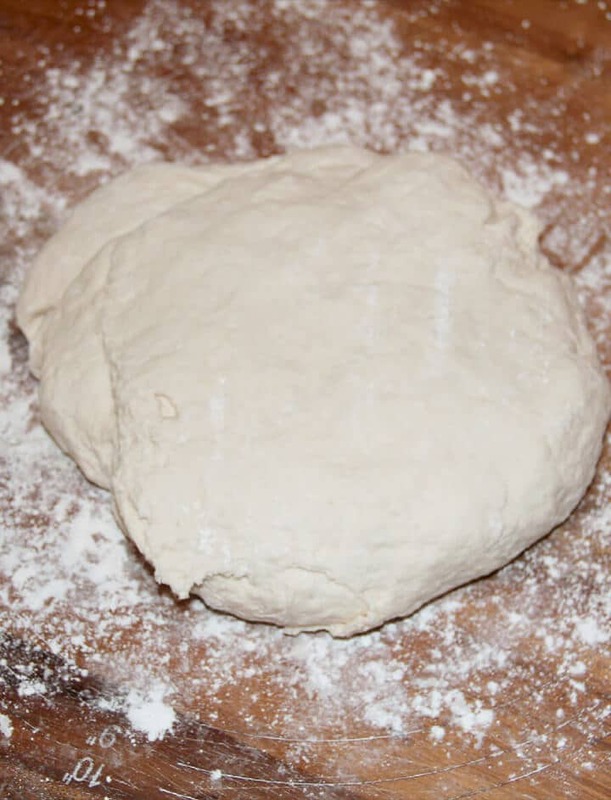 You want to get the dough where you can easily lift and turn and begin to knead the dough. Once you can pick up the dough, turn it out onto whatever pre-floured surface you will use to roll it out. **Cook’s Tip: Sprinkle on additional flour so the dough doesn’t stick to your hands and knead it well until you have a smooth, non-sticky dough for your fried apple pies. Alright, you have the dough and the apple filling so let’s talk about how to make fried apple pies—time to put it all together! Next you will pinch off small pieces of fried pie dough and roll into balls. The balls should be slightly smaller than a ping pong ball. Take each ball of dough and roll out until it’s pretty thin, then put a heaping spoonful or two of apples on one side, leaving an edge for sealing. It usually takes one or two pies to be able to judge exactly how much apples to spoon on. 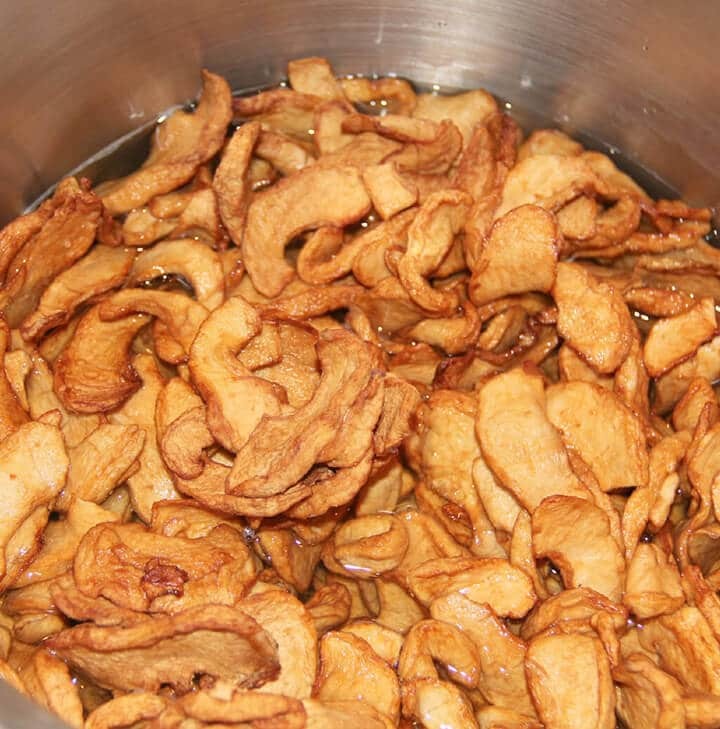 If you put too much, the apples will break through the dough in places and ooze out once you start frying. **Cook’s Tip: You want just enough to make a nice pocket when you fold over the dough. For me, it’s usually about a regular kitchen spoon (not a teaspoon) and a half. Dip your finger in water and rub the edge around the apples, then carefully fold the dough over and press down. The water acts as a sealant and will keep the dough from separating. Then take a fork and crimp the edges together even more. Lay each pie on a large cookie sheet and continue until they are all ready. **Cook’s Tip: You want to have this part fully completed before you start frying because they will only take a minute or two per side to fry. 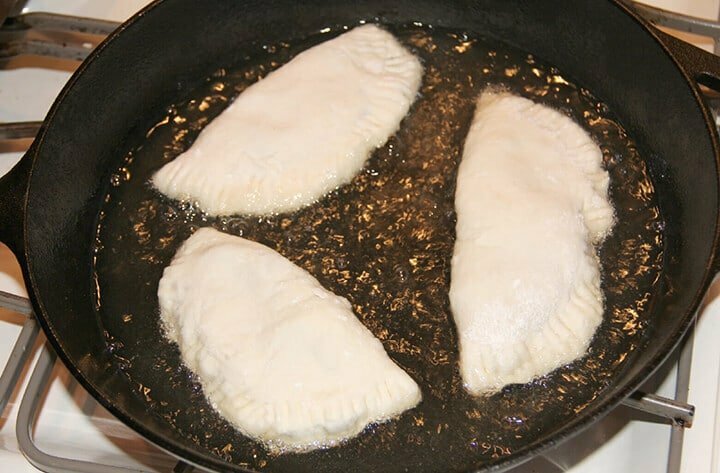 Once you have all the fried pie dough rolled out and all the pies made, add about 3/4 cup of shortening and a couple of tablespoons butter (depending on the size of pan) to a large skillet and turn to medium-high to melt. Keep the shortening nearby because you will be adding more. The melted shortening should come up to not quite an inch in the pan, so that it doesn’t cover the pies but comes about halfway up the sides of the pies. Keep the grease at medium-high, and when it sizzles if you drop in water, it’s ready to go. Carefully lay two or three pies in the skillet, only two if your skillet is small as you don’t want to overcrowd them. After about a minute, peek underneath one of the fried apple pies and if it’s golden brown then go ahead and turn them. The dough is thin and the apples are already cooked, so it literally takes about three minutes to fully cook the pies. You have to watch them the entire time so they don’t burn because it can happen quickly. After a few batches, you’ll probably need to add more shortening and butter to the skillet, so let it melt before you add more pies. **Cook’s Tip: You may need to clean out the skillet and start over with fresh oil if the oil starts burning. Lay the fried apple pies on a large platter lined with paper towels. If not serving immediately, cover the platter with tin foil until you’re ready to serve. Or just sit the platter out on the counter and the fried apple pies will mysteriously disappear. These homemade fried apple pies are best eaten within two days, which is usually not a problem. Caramel Apple Cake – this one is absolutely amazing! Easy Apple Crisp without Oats – one of my most popular recipes! Double Crust Apple Pie – the old classic, you can never go wrong with this one! Easy Apple Strudel – for when you don’t have time but want something delicious! French Apple Turnovers – my baked equivalent of fried apple pies. These are really easy and you can make just two! Easy Apple Tarts – delicious quick and easy apple treats. Delicious, old-fashioned fried apple pies, made the way Granny used to make them using dried apples and homemade dough. Put apples in a large pot or Dutch oven and add enough water to almost cover. Stir in two cups sugar. Turn heat to medium-high and bring to a boil. Turn heat down just a little so apples continue to simmer, breaking up apples with spoon as they cook. Cook until apples are tender and juicy, stirring frequently. You may need to add more water as they cook. Do not allow the apples to get dry. Remove apples from heat and allow to cool. Start with 4 heaping cups of self-rising flour and cut in 3/4 cup Crisco shortening and 1/4 cup butter with a fork or your fingers. Mix well until shortening/butter is incorporated into the flour. 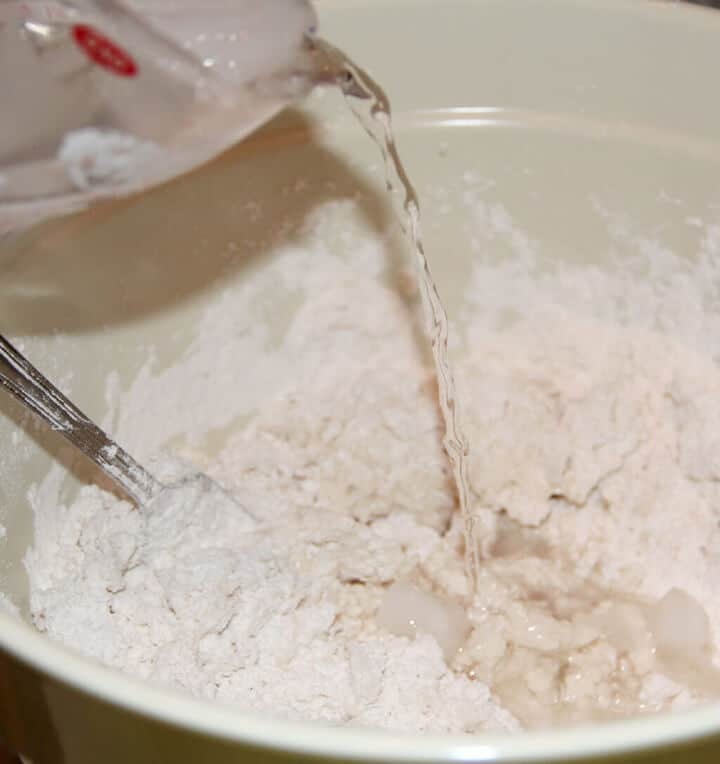 Add 1 1/2 cups of ice water to flour, and add additional ice water as needed to get all the dry flour mixed in. Mix with a fork until dough is sticky. Dip hands in flour and sprinkle additional flour onto dough so that you can knead it. 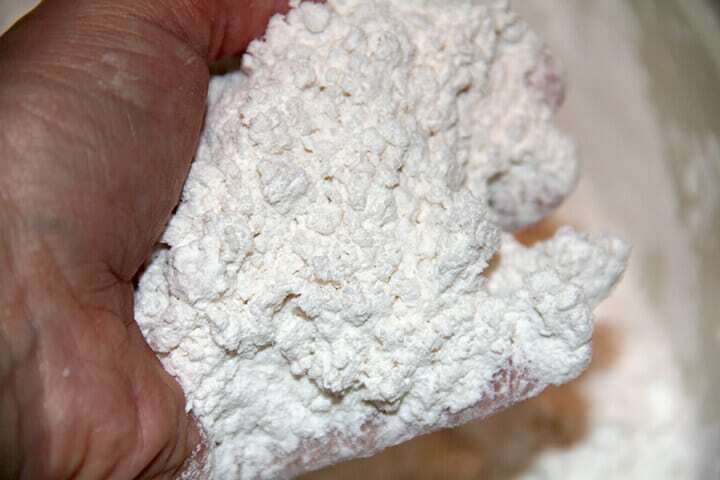 Use additional flour as needed to be able to knead the dough until smooth and non-sticky. 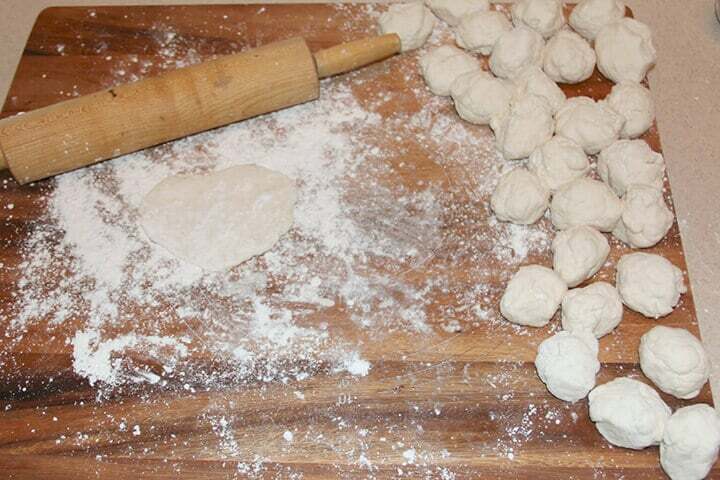 Pinch off pieces of dough to make balls slightly smaller than ping pong balls. Roll each ball out until thin. 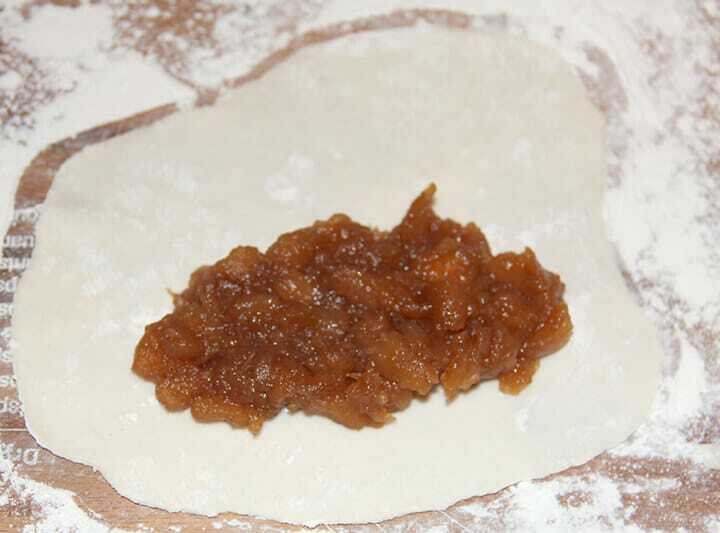 Add a heaping spoonful or two of apples to one side of rolled dough. After the first couple, you will learn exactly how much apples to place on the dough. If you put too much, the dough will not cover without tearing. Dip your finger in water and rub around the edges of the dough where the apples are. Carefully fold the dough over and press the edges together lightly to seal. Using a fork, crimp the edges to fully seal. Once all the pies are ready, add about 1/2 cup Crisco shortening and 2 tablespoons butter to a large skillet and heat on medium-high. Once the grease is hot enough to sizzle from a drop of water, carefully lay two or three pies in the skillet. Cook about a minute to a minute and half on each side until they are golden brown. Lay pies on a large platter lined with paper towels and serve immediately. If you can't find dried apples in your grocery store—and don't buy the commercial ones in the aisle with all the dried fruit because they take forever to cook down and they are expensive—try these that I found online. As the apples are cooking, you'll need to take a wooden spoon and break them up a bit. Watch the apples carefully and add additional water if the water starts cooking down too much. Stir frequently so the apples don't stick to the bottom of the pot and scorch. Once the apples have cooked completely, you can place some of the apples in another dish to help them cool faster. 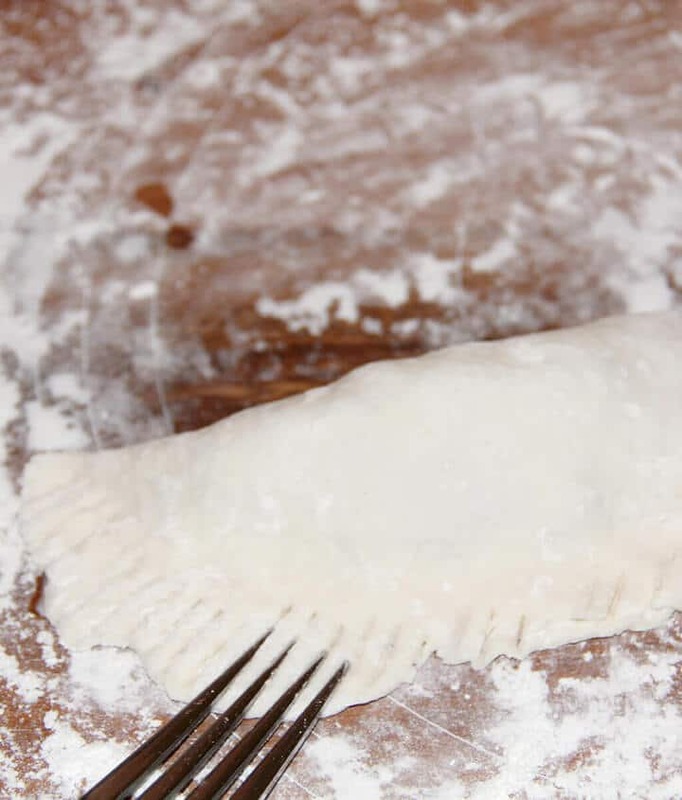 Sprinkle on additional flour to the ball of dough so the dough doesn't stick to your hands and knead it well until you have a smooth, non-sticky dough for your fried apple pies. You want to make sure all the shortening and butter is incorporated into the flour. The oil needs to stay hot. Pies will cook quickly and also burn quickly. 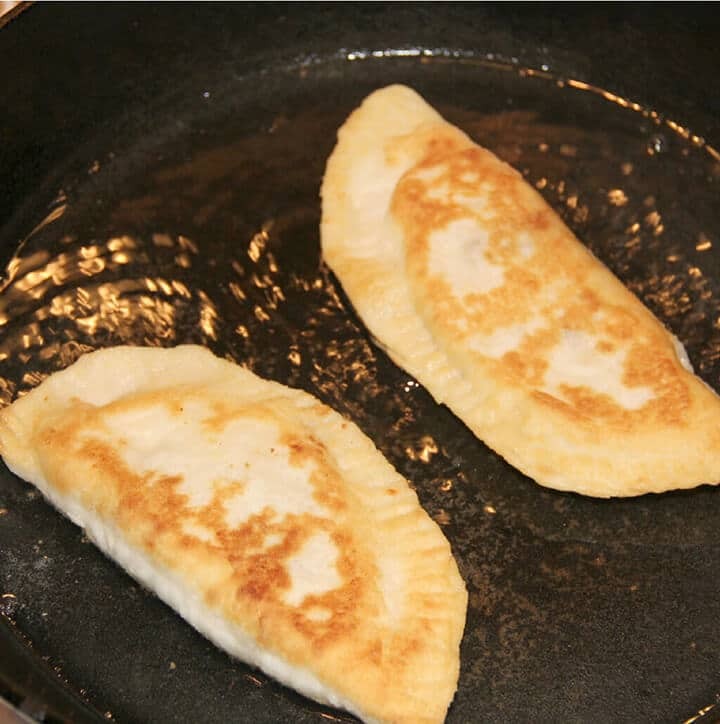 While frying the pies, you may need to clean out the skillet and start over with fresh oil if the oil starts burning. Remove cooked pies to a paper-towel lined platter. These fried pies do not need to be refrigerated. They will keep for a few days in an airtight container but are best eaten within two days. Update Notes: This post was originally published April 14, 2011, and on October 12, 2018, was updated with one or more of the following: step-by-step photos, video, updated recipe, new tips. So many people TRY to make FRIED PIES and they fail horribly. Fried pies are not meant to be DEEP FRIED IN A VAT OF OIL. They are meant to be done EXACTLY LIKE YOU DID THEM. My Grandma (God Rest Her Soul) use to make apple and peach pies. For years and years I would help her dry the apples and peaches and then later we would make a batch of pies sometime. Do I ever have memories. 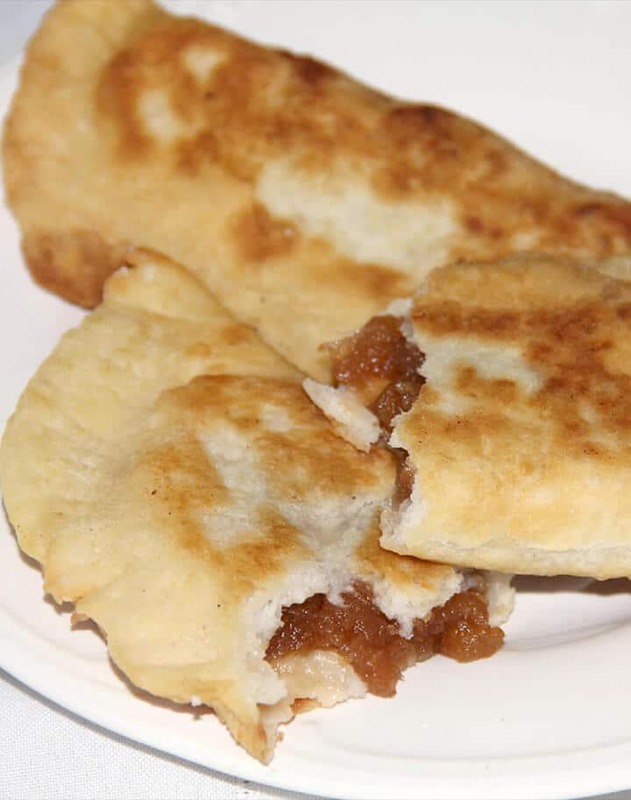 Thank you so much for share with the world THE TRUE AND PROPER way to make FRIED PIES FROM DRIED FRUIT. I’ve eaten many fried pies that were made by my mom & grandmother, but the pies I made just didn’t live up to theirs. My crust was either bland or tough. That is until I found this recipe! They are awesome!!!! Crisp around the edges, slightly soft in the center & FLAKY. Thank you for sharing. Do you know if these pies can be frozen for storage prior to frying? I am glad to finally get the recipe for the dough. I have been using canned biscuits for years. Even if they are much easier to make the homemade dough is so much better. Thanks for sharing this recipe. Fried apple pies also freeze well. After you let them drain on a paper towel and cool down wrap them individually in Saran Wrap then wrap in Reynolds Wrap. Then put them in a large freezer bag. I take one out at a time and zap it in the microwave for about 30 seconds. They are just as crisp after microwaving as they were when I fried them. These are so much like my Mama made!! She did use spices to give them a very distinct flavor. I will test the different spices until I get the taste of hers. Thank you so much for the details so I can share this with my granddaughters and nieces. To put a spin on fried pies, one summer Mama canned fresh pears and let them cook too long and they turned into a sauce like apple sauce. They made the BEST fried pies (tarts) we ever had. Can’t wait to make some!!!! BTW: Love your Blog! I believe this recipe is just what I was looking for! I was too young and stupid when Granny passed away to realize how much I would value her recipes one day. I deeply regret not spending the time to have her show me – Gosh, those would have been some great memories. I do have one question though, why do you dry the apples first? Are fresh apples too juicy? Stephanie, sorry to be so late replying to you! I believe it’s because fresh apples would be too juicy. The apples are not dried just for this recipe. We always dried apples for the winter. Its a fun family thing to do. Peel slice dry and store. Dried apples make such a tasty snack. my mom used to make fried peach pies but i can not find the dried peaches or apples at the stores where i shop. Yes Amazon has them . Our Piggly Wiggley has them . I wish the last ten minutes of my life would be spent eating Mama’s fried apple pies and a glass of milk. We called them “apple jacks”. 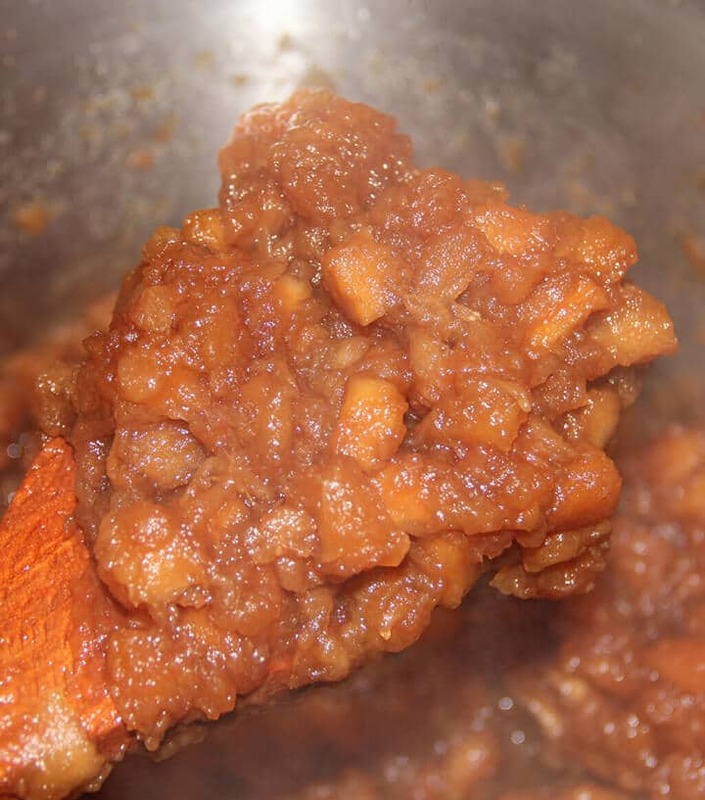 Her recipe was made with which ever was on hand, dried apples or fresh apples made into extra chunky applesauce. Try using cinnamon, cloves, &/or apple pie spice. Also, I use very little or no sugar in the sauce. Just once, try frying in organic lard if available. No, it is not the healthiest way, but the flavor will knock you back fifty years to Mama’s kitchen! Glad you still have your Granny around. Mama died without ever having her recipes written down, so it took a lot of years to get things right. The one thing I have is plenty of southern comfort family recipes. 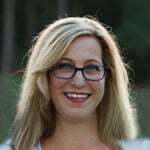 Just found your blog (from ShawnsPlate) and can’t wait to check it out. These fried pies are just like my mama made with the dried apples & Crisco. Can’t wait to make these for my family. Thank you for the recipe!!!!! I made these fried pies twice with my Granny, trying to get them just the way she made them. And of course she doesn’t measure, so it was a process! I still think hers are better, but these are pretty close. Hope you enjoy!